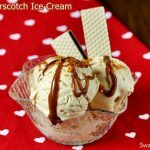 Butterscotch Ice cream recipe without icecream maker and eggs. 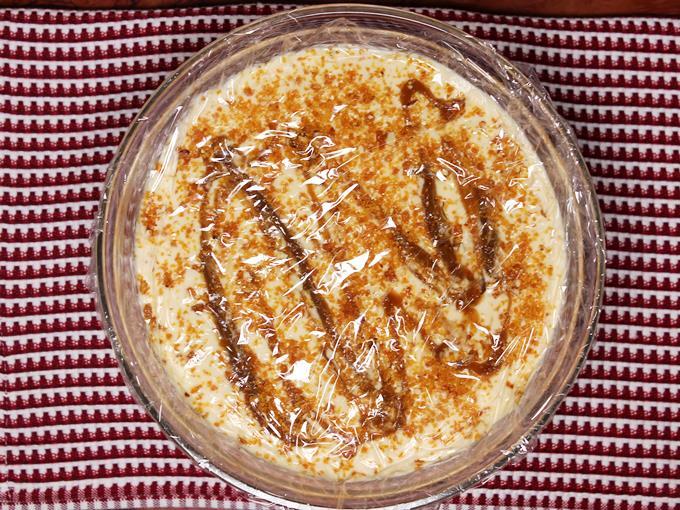 Butterscotch is a popular confectionery made using brown sugar and butter. 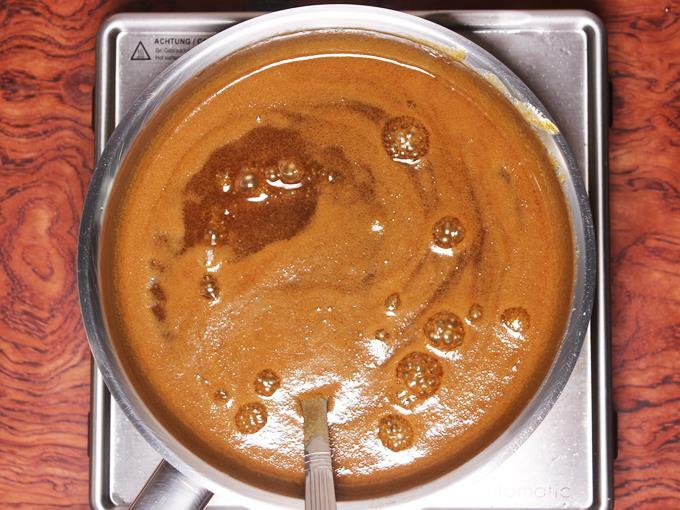 This post details the process of making butterscotch sauce, making basic ice cream and then using the sauce to flavor it. 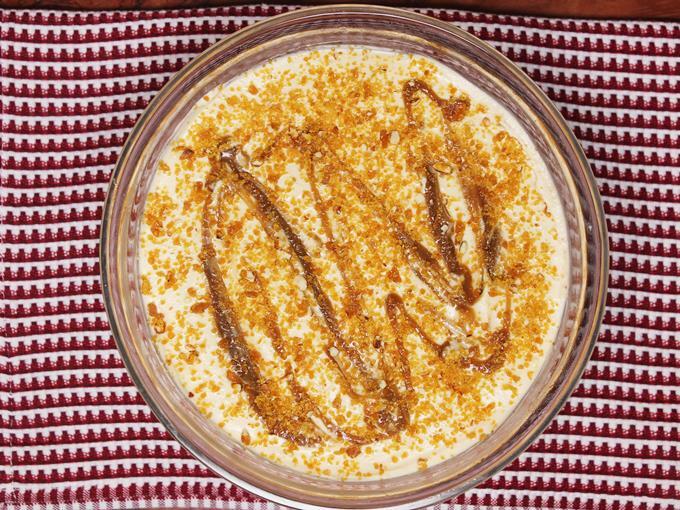 You can also use ready made butterscotch chips and skip the sauce part in this recipe. But using fresh made butterscotch sauce enhances the flavor. If you have a Icecream maker or a kitchen aid attachment, then you can follow this post on How to make ice cream. 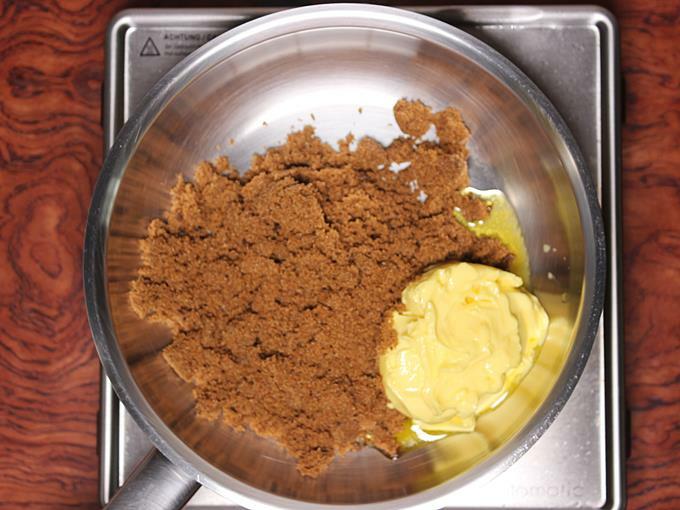 Then make the butterscotch sauce from this post and mix both of them. The recipe mentioned there doesn’t use condensed milk. 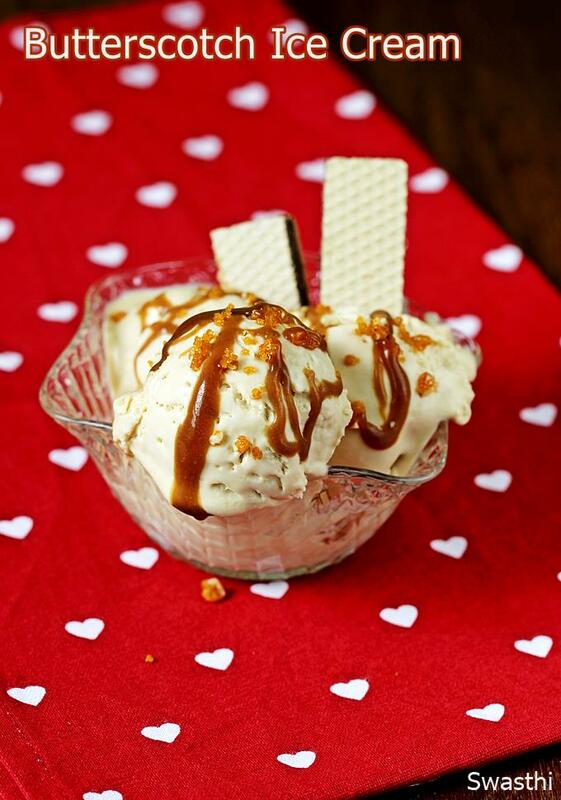 Recipe to make homemade delicious, no churn Icecream flavored with butterscotch sauce. 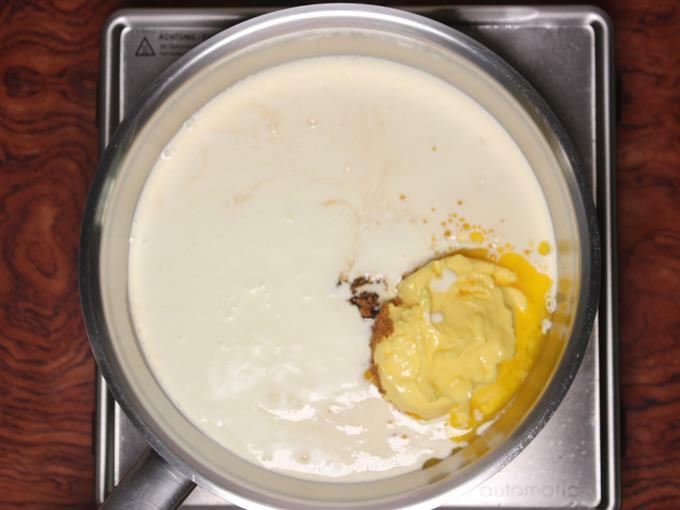 Melt butter in a pot on a medium heat. Stir together and bring it to a boil. Simmer for 5 minutes on a medium to low flame. The sauce turns slightly thicker but still of pouring consistency. Pour vanilla. Turn off the heat and cool completely. 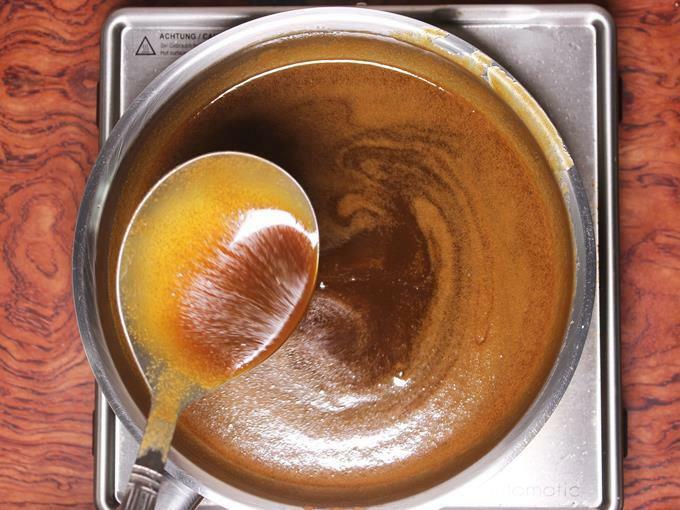 Butterscotch sauce turns slightly thick when it cools down. Store it in a cool dry jar and refrigerate. This keeps good for about 3 to 4 weeks. 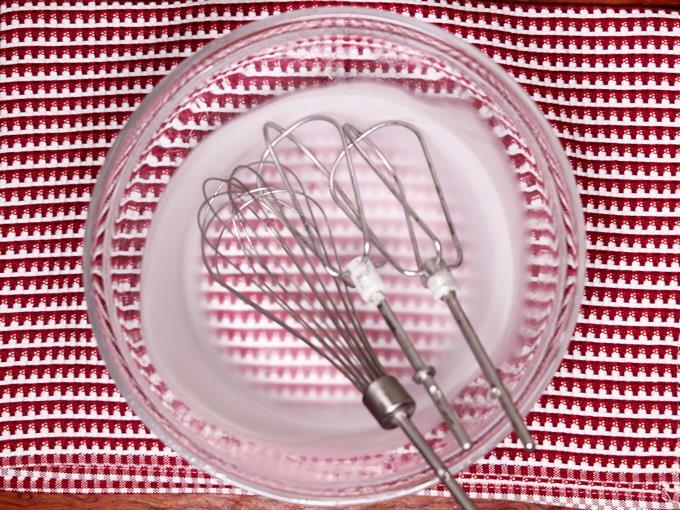 Chill a large bowl and the whisk or attachments of the hand mixer for at least 24 hours in the freezer. 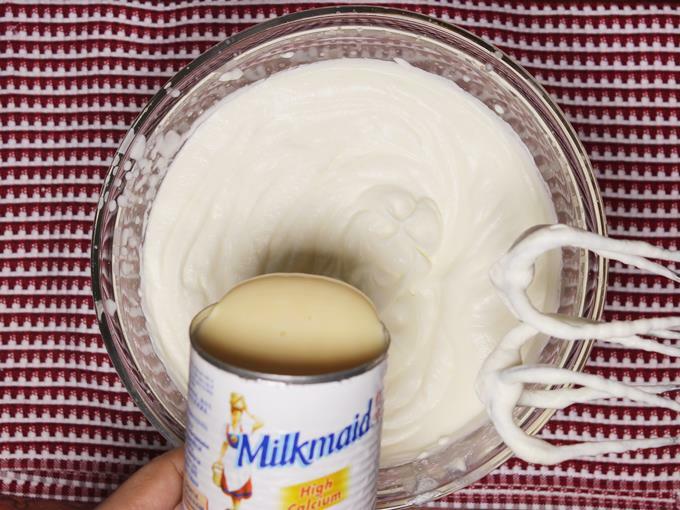 Pour the chilled cream to the bowl. Begin to whip on a low speed and then on a medium speed. 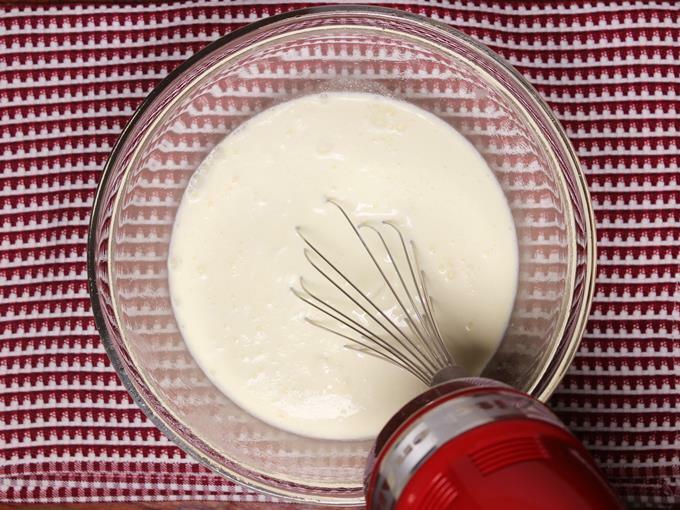 The mixture turns frothy at the first stage and then begins to turn thick. 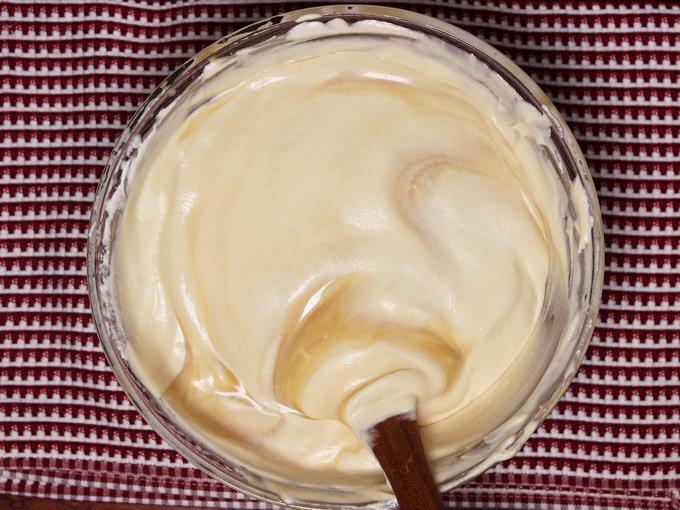 Whip it until you see stiff peaks in the cream. Add the condensed milk and butter scotch sauce. You can set little sauce aside for topping. Gently stir until all of them are mixed well. Do not over mix or stir vigorously as the cream may deflate. Taste the ice cream. If you feel you need it a bit more sweeter then add more condensed milk and mix. Drizzle some butter scotch sauce. Sprinkle praline as desired. Cover it with a cling wrap. Press it down to the mixture to avoid ice crystals. Cover and freeze overnight or more for the ice cream to set. 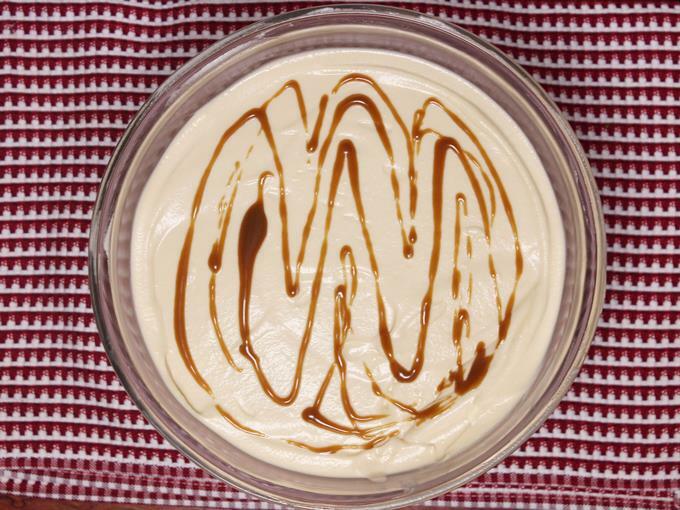 Scoop the ice cream to bowls, Drizzle some sauce and then praline. Serve butterscotch ice cream immediately. Please do not gauge the quantities of ingredients in the pictures. I had tripled the sauce quantities and doubled the basic icecream recipe. Hence the quantities you see in the pictures will not match those in the recipe card. 1. 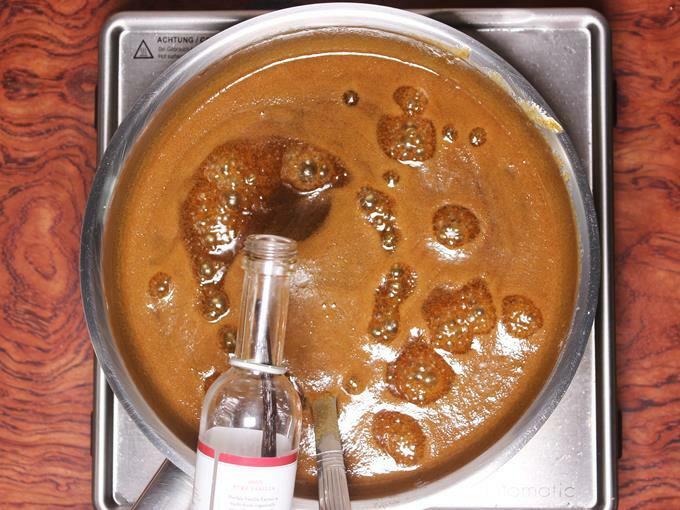 I had prepared the praline and butter scotch sauce days ahead of making the icecream. You can do the same. 2. Add butter to a pan and begin to melt it. Add brown sugar. 3. Pour milk. 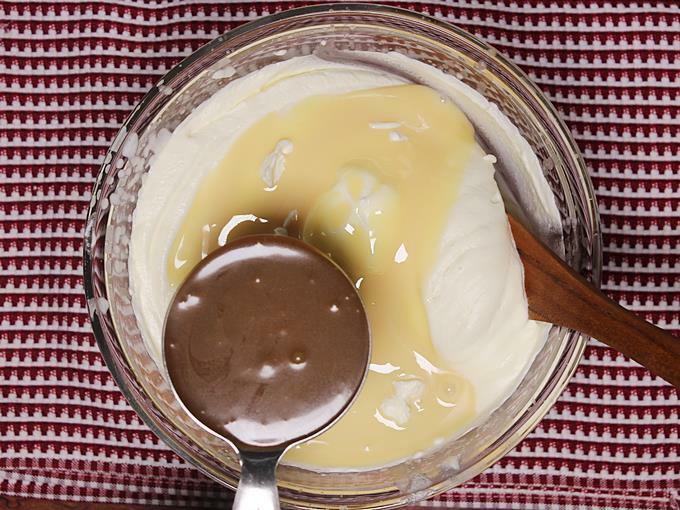 Usually for butterscotch sauce cream is used. But I felt using cream makes the ice cream extra fat and creamy. So milk is a better choice here. 4. Mix and bring it to a boil on a medium flame. 5. When it begins to boil, simmer for 5 minutes on a medium to low flame. Add vanilla extract. 6. The mixture turns slightly thick but still of pouring consistency. Turn off the stove and cool it completely. 7. Transfer to a glass jar and refrigerate until used. 8. Chill the bowl and attachments for at least overnight to 24 hours. Also chill the cream. 9. 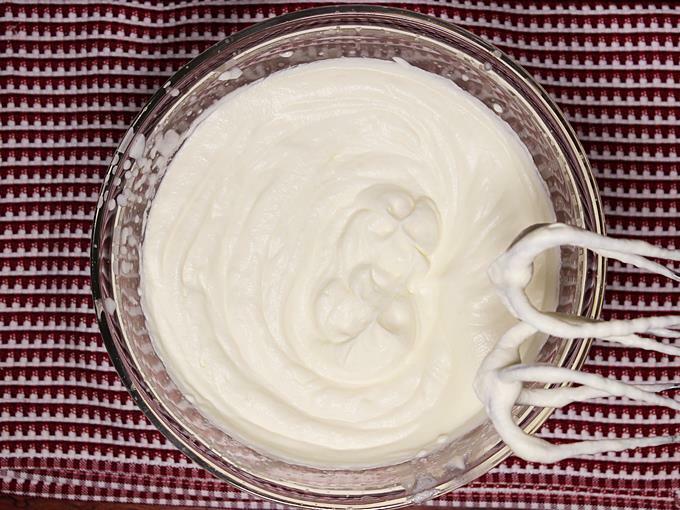 Pour the chilled cream to the bowl. Begin to whip on a low speed. 10. Whip on a medium speed until you see stiff peaks. Do not over whip the cream. 12. Pour the sauce. The sauce turns slightly thick after cooling but should be still of pouring consistency. If it is too thick, you can add little milk and mix it. 13. Gently mix all of them without deflating the cream. 14. 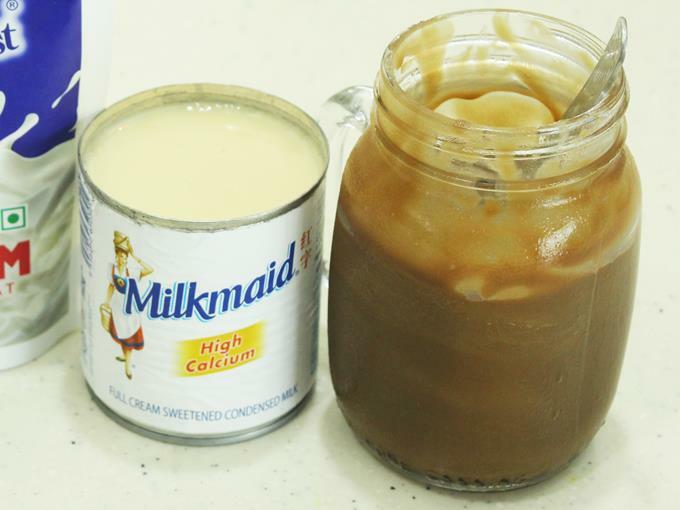 Taste it and add more condensed milk if desired. 17. Place a cling wrap on to the cream. This helps to prevent ice crystals. Cover and freeze until set. I freezed it for 15 hours. Since this is not churned in a machine, it is best to finish it in a couple of days. Ice crystals may form if kept for many days. 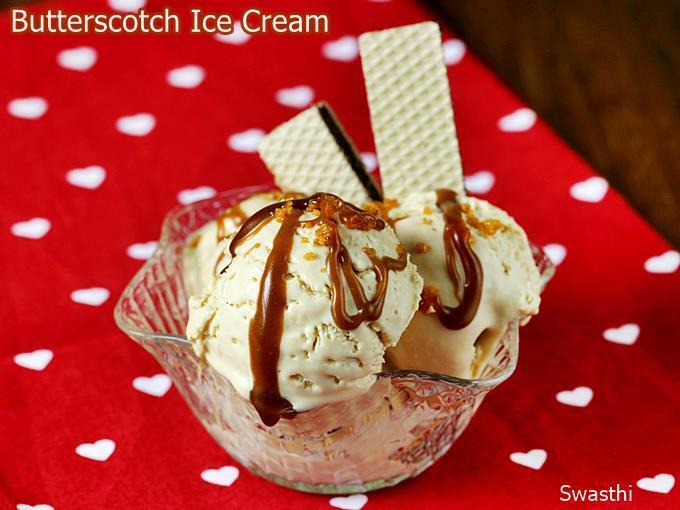 Scoop butterscotch ice cream to bowls. Drizzle some sauce and sprinkle praline. Thanks much for the recipe. Do we use the whole butterscotch sauce for the given proportions of the icecream? I will update the post. I forgot to mention. Set aside 1/4 cup sauce. Add the rest and check the sweetness. If needed add more condensed milk. Use the sauce for topping. I was left with 2 tbsp sauce after topping. Thanks much for the prompt response! I tried it. Turned out damn good!! Thanks for the recipe. I am left with some sauce. How long will it keep good? Thanks for trying. It will keep good for 3 to 4 weeks in fridge.